At the 2017 AGM it was decided that our local rules would be posted on the noticeboard in the golf shop and on this blog. 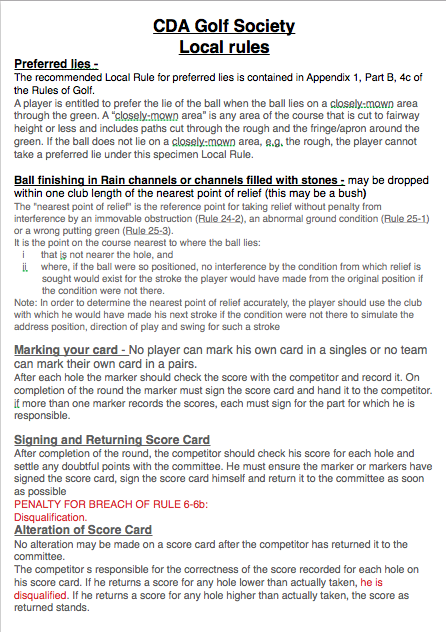 Here are the current local rules for the Condado de Alhama golf society. When the green keepers have been maintaining the course by cutting the edges of the grassed areas, a sharp and high edge is often left. Also there are other areas on the course where such high edges are incorporated in the design of the course. Due to the nature of the course, a played ball may come to rest against these high and sharp edges. Consequently, playing such a stroke could cause injury and damage to the course. Where a ball come to rest within the length of a scorecard ( approx. 8”or 200mm) from such a cut edge, and the ball is below the height of the cut edge, with all the playing partners in agreement that playing a stroke could cause injury or damage, a player may take relief without penalty. Such relief must be taken on the same surface as where the ball came to rest, the ball dropped within one club length from the edge and no nearer the hole. Due to members visiting infrequently it is easier to allow preferred lies (on close mown grass only) throughout the year, rather than take the rule on and off, with some players using one rule, and other players another.